The Beets of Today look quite different from the Beets of the Past. In the Middle Ages, beetroots were long and thin, not plump and round as they are today. Not large enough to be considered a culinary must, the beetroot was used primarily for medicinal purposes, while its leaves were more widely consumed in meals, treasured in salads. The beetroot is a taproot, meaning the part we eat is the largest, most central, most dominant root from which other roots sprout laterally. It was first cultivated for consumption in Germany and Italy in the 1500s, and was selectively bred over time to take on the bulbous shape we now recognize. It’s popularity thereafter grew in northern and eastern Europe because it grew so well through harsh winters.The typical blood-red color was only selected and bred for in the mid-18th century. 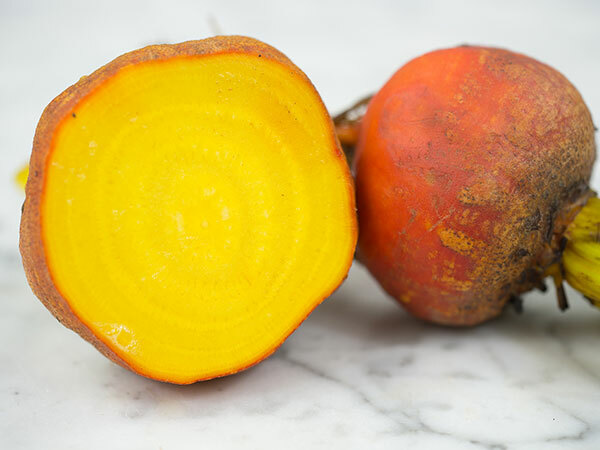 While blood-red beets are most common, there are a wide variety of beets grown for specialty characteristics. There is Cylindra, grown for its long, cylindrical shape; Touchstone Gold, with small yellow roots; Green Top Bunching, with bright red roots and superior greens; Golden, known for their buttery yellow color and sweeter, mild flavor; and Chioggia, an Italian heirloom with striped red and white interior like a candy cane. In the mid-1700s, a German chemist, Andreas Sigismund Marggraf, discovered a way to derive sucrose from beets, which eventually led to its use in beer, tobacco, and molasses. The King of Prussia decided to subsidize this industry, building the first production plant in what is now western Poland. This turned out to be a great investment. White sugar beets are not common for public consumption, but are widely used for sugar production today, responsible for around 20% of the world’s sugar. They require four times less water than sugarcane, making them attractive especially in drier countries like Egypt. Despite a rich and prosperous history, the beet is today a contentious vegetable. People tend to either hate it or love it. Many say it tastes like dirt. Well, to be fair, it does grow up underground, entirely encased in dirt. But so does every other root and bulb vegetable, and folks never balk at potatoes or onions, which sit pretty among, to be honest, a rather unimaginative list of American culinary staples. It’s no wonder, then, that the beet didn’t make the cut. There’s something a little too “earthy” about the flavor. And the texture of those nasty canned beets doesn’t do the misunderstood veggie any favors. Perhaps it is our cultural antagonism towards everything healthy, instilled at a young age, which has inspired such disdain. Even President Obama openly dislikes beets! All the beet haters rejoiced when they found out. “See! The President is one of us!” Despite containing an extensive array of 55 varieties of vegetables at its inception, the First Lady’s White House vegetable garden explicitly excluded beets. Delicious AND healthy? Beet that! The blood-red antioxidants in beets called betalains have a variety of positive health impacts, which include reducing the risk of cancer, heart disease, diabetes, and inflammation. Inflammation has become a chronic condition for many in our stressful, contemporary society and is linked to a plethora of disagreeable symptoms and diseases. Ancient Romans believed that beets and their juice encouraged feelings of love. Makes sense: they are high in natural nitrates, which act as an aphrodisiac. The Greek goddess of love, Aphrodite, apparently privy to this gem of knowledge, ate beets to enhance her appeal (as if she needed it, she was a goddess, c’mon…). Put simply, beets want you to get down. How thoughtful of them! Also, you can eat beets and become a professional athlete instantly (well, not exactly). Studies have shown that beetroot juice increases the length of time professional divers can hold their breath by 11% and increases cyclists’ riding time by up to 20%. Okay, so I couldn’t find any pop songs about beets, but I did find these hilarious children’s songs: Sesame Street and Nature’s Jam. Now you love beets. So how do you use them? So you’re sold on how awesome beets are, but is that enough to get you to eat them more often? Maybe you need some culinary advice. In general, beets pair well with tangy, pungent cheeses; acidic foods like oranges, lemons, and vinegars; smoky foods like bacon, smoked fish, and smoked meats; and grains and legumes like lentils, quinoa, and barley. Wow. That’s just downright cruel. Below are some awesome recipes to get you started. Hop on the beet train! Jul 5 Welcome to the New Imperfect Blog!